The Pittsburgh Penguins clinched their 11th straight playoff berth last Tuesday against the Buffalo Sabres. By the end of the season, unless Detroit pulls off some sort of miracle, it will become the longest current playoff streak in the league. But the Penguins haven’t won since Tuesday. On one hand, it’s not all that alarming because Pittsburgh is dealing with a depleted lineup. Ensuring everyone gets healthy for the postseason run is more important than winning games right now. Depending on who you ask, though, the Penguins also still want to catch the league-leading Washington Capitals and earn the top seed in the Eastern Conference. Every point matters if that’s of importance, so playing all-out, playoff hockey is likely the way to go. As I’ve argued on Steel City Hockey a few times, the health of Pittsburgh’s superstars is most important at this point in the season. Coach Mike Sullivan shouldn’t let anyone play through an injury the next two weeks because ensuring everyone is as close to 100 percent as possible is more important than winning the Presidents’ Trophy. For the most part, Sullivan appears to be following that formula. As hockey fans know, the public isn’t privy to many injury facts, but it seems as though some Penguins are sitting as a precaution. Center Evgeni Malkin suddenly went out of the lineup after a very successful road trip a week and a half ago because Sullivan said he had been dealing with an upper-body injury for “quite awhile”. Sullivan said the same of wing Scott Wilson, who left the lineup Friday when Bryan Rust returned. Malkin sitting out strikes me as very precautionary, as opposed to necessary. And that's fine. At this point, just let him heal. Now, this isn’t the case with everyone. Trevor Daley, Olli Maatta, Carl Hagelin and Jake Guentzel are out with significant injuries. But it’s possible Pittsburgh will hold them out longer than expected in the hopes of ensuring complete health for the postseason. Earning home-ice advantage would be great and all, but it’s not necessary to win the Stanley Cup. Three of the last six Stanley Cup champions have won a Game 7 on the road. Last season, Pittsburgh beat Washington in the second round without home ice and defeated the Lightning in Tampa Bay in an elimination Game 6 to force a decisive Game 7 in the Eastern Conference Finals. Clearly, playing well and remaining healthy heading into the playoffs is far be more important than home ice. This season, though, isn’t like most in the Metropolitan. With the current playoff format, the Penguins will be at a disadvantage if they finish second or third. In the event that happens, Pittsburgh would face one of the best three teams in the league in the first round. If they finish third, the Penguins likely won’t possess home ice in either of the first two rounds. There’s certainly a matter of pride at stake here too. Pittsburgh doesn’t want to finish third behind its rivals – Washington and Columbus. Ian Cole on winning the division: To say it doesn’t matter—that would be a lie. And even if the division wasn’t at stake, the Penguins can’t expect to just mail in the final two weeks of the season and then turn on the switch in mid-April for the playoffs. Coach Mike Sullivan and General Manager Jim Rutherford likely want this team hitting its stride right now, peaking as it did last season, in March and April. But this goal contradicts the first objective (resting players). Again, the Penguins have players that wouldn’t be playing regardless of the situation, however, Sullivan appears to be faced with the nightly challenge of deciding whether to risk injuring a player such as Malkin even further or letting him rest and be fresher for the postseason. Time to Concede the Metro? Since Pittsburgh hasn’t won in almost a week now, the Penguins’ grip on goal No. 2 appears to be slipping away. Pittsburgh remains tied for second with Columbus, but the Blue Jackets own a game in-hand. The Penguins also sit three points out of first place, and it could be five if the Capitals, who also possess a game in hand, win Tuesday. The Penguins looked awful in their latest game versus the Flyers on Sunday night, falling 6-2. Of their remaining seven games, they face five squads currently in a playoff position. Pittsburgh’s final three games are also on the road. So like when is the Penguins going to play like the team that could still take 1st place in the division and thus the easier 1st opponent? Given the deficit and the strength of the schedule, it’s not likely Pittsburgh will chase down Washington. The Capitals do start a five-game road trip Tuesday, but two of those games are against bottom-feeders Colorado and Arizona; another will be against the struggling Minnesota Wild. It’s time for Pittsburgh to concede the division and rest everyone who is the least bit injured. Even more importantly, no more blocking shots until the playoffs begin. Although Sullivan disputed the report that Conor Sheary left Sunday’s game after he blocked a shot, speculation has run wild that injuries as a result of blocking shots is why Malkin and Carl Hagelin are currently out of the lineup. HCMS on blocked shots: "If you're alluding to Conor Sheary tonight, it wasn't a blocked shot. So that's misinformation." Pittsburgh cannot afford to lose any more players to blocked shots in any of the next seven games. 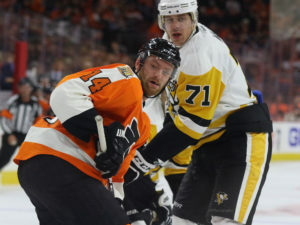 Of course winning, playing well and feeling good heading into the postseason are important, but with the chances of winning the division fading, the Penguins must turn their attention to objective No. 1.